Without a doubt, you have a million questions when someone close to you is being treated for a head injury. 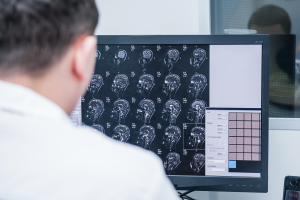 Traumatic brain injuries are always unexpected, and when they occur, things need to happen quickly in order for the victim to receive the proper emergency medical care as soon as possible. Professionals use several tests and measurement scales to diagnose a patient with a TBI, which help determine the severity of the patient’s condition after the initial impact. The Glasgow Coma Scale was developed in 1974 by Graham Teasdale and Bryan Jennett. This devised scale assesses three conditions: a person’s ability to open their eyes; their ability to speak; and their motor skills. The scores derived from these three categories are added together in order to assess whether a person has a mild, moderate, or severe TBI. A patient that scores higher than 13 is classified as mild, a score between a 9 and a 12 is moderate, and any score at an 8 or below means that a person has a severe traumatic brain injury. The Glasgow Coma Score provides a great foundation for assessment after the initial impact to the head. Memory loss and consciousness are also factored in when determining mild, moderate, or severe traumatic brain injuries. After the initial shock has passed, medical personnel will perform tests to see how the patient responds to various cognitive and motor exercises. This will give them a better idea as to the severity of the patient’s condition, as well as their rehabilitation needs moving forward. The cognitive tests will involve problem-solving, memory, thinking, and reasoning exercises. Neuropsychological tests are cognition-focused, but will also employ the use of basic motor functions to give comprehensive insights. One of the more common ways that traumatic brain injuries affect people is through speech. People who struggle with speech are often challenged by their weakened ability to control the muscles they use to speak, a condition called dysarthria. Speech and language tests will be administered by a speech-language pathologist to assess muscle coordination, witness the pace, volume, and tone of voice, observe retained reading and writing abilities, and evaluate vocabulary. If you are faced with long-term challenges from a traumatic brain injury, you are not alone. There is a community of people across the nation who are facing similar challenges. By joining TryMunity, you are saying “yes” to connections, friendships, and watching others with TBIs succeed in their recovery journey! Join today by visiting http://community.trymunity.com/.